Vermont: 4pm – 7pm, Middlebury Town Green, Middlebury, VT. w/special guests Bernie Sanders, David Zuckerman, Deb Richter and more. Music from Julie Winn and Bob Makenzie Band, food from Lu Lu Ice Cream and Lickskillet. Background: The Labor Day Political Revolution Party will celebrate the one year anniversary of Rights & Democracy, as we fight to bring the political revolution home and announce our new Political Revolution Voter Pledge. 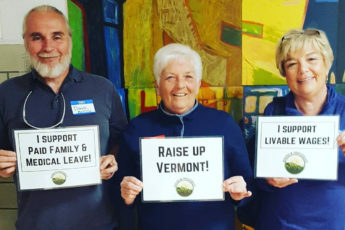 It will be a great opportunity to learn about and in some cases meet the candidates we are supporting across Vermont and New Hampshire who will move this agenda on a state level. You will also be able to learn about Our Revolution, a new national group inspired by Bernie’s campaign to push a progressive agenda forward on environment, social justice, healthcare, the economy and more by supporting candidates and issues all across the country. Rights & Democracy launched a year ago to build the political revolution on a local level to impact elections and move forward issues like a $15/hour minimum wage, universal healthcare, and environmental justice. Vermont saw major gains for political revolution at the state primary on August 9th with Progressive David Zuckerman winning the Democratic Primary race for Lieutenant Governor and many of Rights & Democracy-endorsed candidates winning legislative primaries. The full report is available here.